As we look back on the past year during this Thanksgiving weekend, Nancy and I are deeply grateful for the lives we were blessed to touch through our international ministry (primarily Nancy) and the progress we’ve made on our new home. Investing our God-given resources to help others also blesses us. Transforming the old church building into our home has been a wonderful year-long adventure. After the progress we made this week, we hope to move into the house before Christmas. As you can see in the picture, we now have a garage door. We also have heat! The HVAC guys finished most of their work and the geo-thermal heat pump is now functioning. This week our contractors installed the rest of the kitchen cabinets. We expect the counter top to arrive next week. We also completed much of the tiling in the bathrooms and we ordered the kitchen appliances. Due to holiday sales, we were able to purchase the range, dishwasher, and microwave oven for less than the normal price of the range! Our son, Jesse, and his fiance, Cecile, and their friend, Miles, joined us for Thanksgiving at my parents’ home in Benton, PA and then came to Lititz to help us begin moving our stuff from storage into the house yesterday. So, for the first time since last winter, we have access to many of our personal items. As you might guess, we are eager to move into the house. Nevertheless, we are grateful for the opportunity to pause and remember the many ways God has blessed us during the past year. This week we spent much of our energy on the floors. 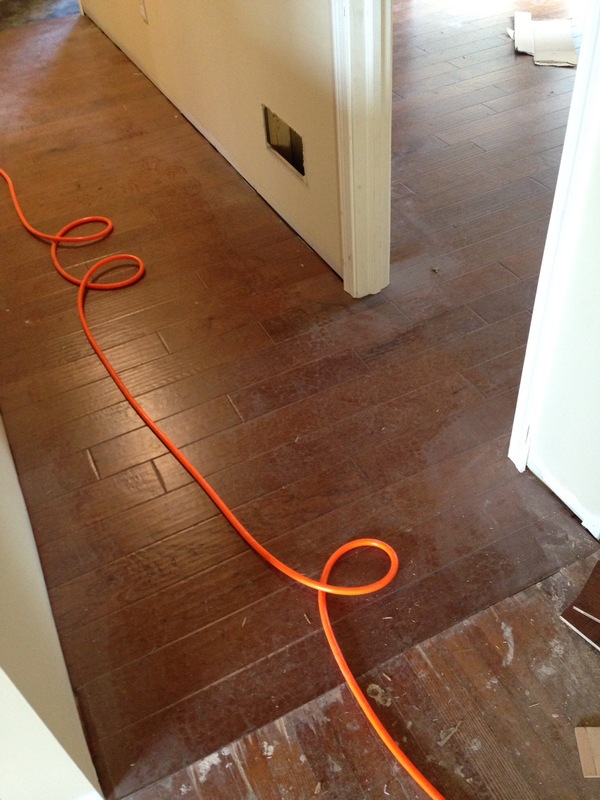 I finished installing the engineered hardwood in the bedrooms and started tiling the master bathroom and kitchen floors. So far, everything seems to be turning out okay, although there were a couple times I questioned the wisdom of trusting such highly visible aspects of this project to an untrained amateur. Nancy continued to hang shower tiles. She was slowed by a trip to upstate New York to take care of some business with her mother. She also need to rest sore fingers that were eaten raw by the mortar. She will wear gloves from now on. More kitchen cabinets arrived. I was not aware that the used cabinets we were purchasing do not match. You can imagine our surprise when we realized that, so far the kitchen cabinets have four different door designs and two different hardwoods, oak and maple. Hmmm… I wonder what creative solution we will come up with this time??? Nancy and I will leave for Ridgewood, NJ in a couple hours to join in Grace Church’s Global Impact Sunday. We look forward to reconnecting with our friends there and helping them remember that our God is global. He is the only lasting hope in our troubled world. He has given us the privilege and responsibility to invite all people from all nations to his eternal Kingdom. From the beginning of this project, Nancy and I have worked to contain costs by being personally engaged in the work. Specifically, I have chosen to adjust my travel schedule during construction so I can complete a number of tasks. Each task that I complete saves us money. I am grateful that our ministry commitments and schedule have allowed for this flexibility. For example, we are saving thousands of dollars by installing the shower tiles and hardwood floors ourselves. 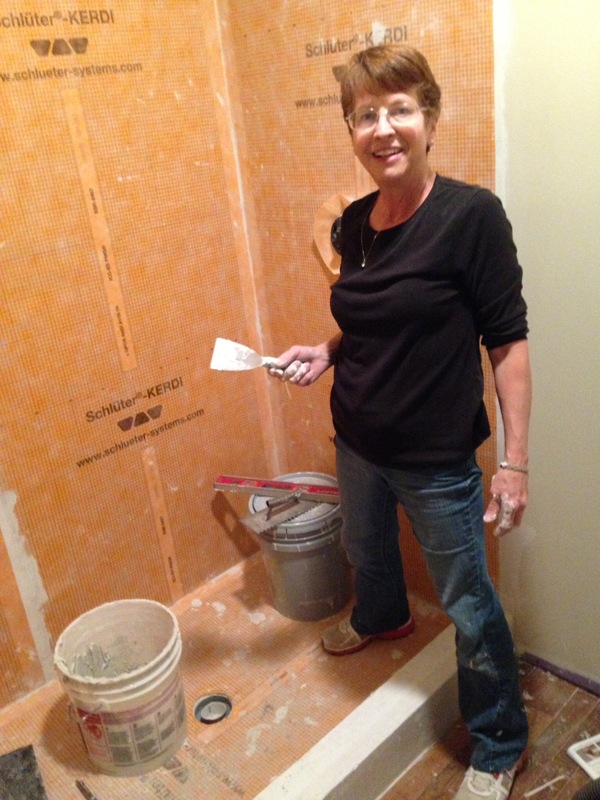 This week Nancy started working on the showers and I started the floor. We are slower than the professionals, but we hope to get the same result at a lower cost. We have also worked to contain our end cost by downgrading our cabintes, counter-top, floor coverings, etc. For example, we purchased the kitchen wall cabinets this week for $150! This blessing came from a local retirement village who sold us the used cabinets at half thier normal heavily-discouted price. Nevertheless even with these savings, our costs are running over-budget. Much of this overage was caused by the rocks that needed to be dug out of the basement and foundation. We also encountered increased costs in renovating some parts of the old building. So, I am working with our bank to increase our funding. I have been assured that they will be able to lend us the extra $20,000 to $25,000 that we expect to need to finish. My prayer is that God will provide us the additional income we will need to pay this back. This week we also completed the fireplace and installed the stained glass window that had been out for repairs since September. It was quiet at our construction site most of this week. We did not make as much progress as I had hoped. However, I am grateful for some small steps. The mason finished the external stonework and I was able to begin installing the floor in the upstairs room that will become my office. Nancy and I also began building the fireplace mantle and hearth. 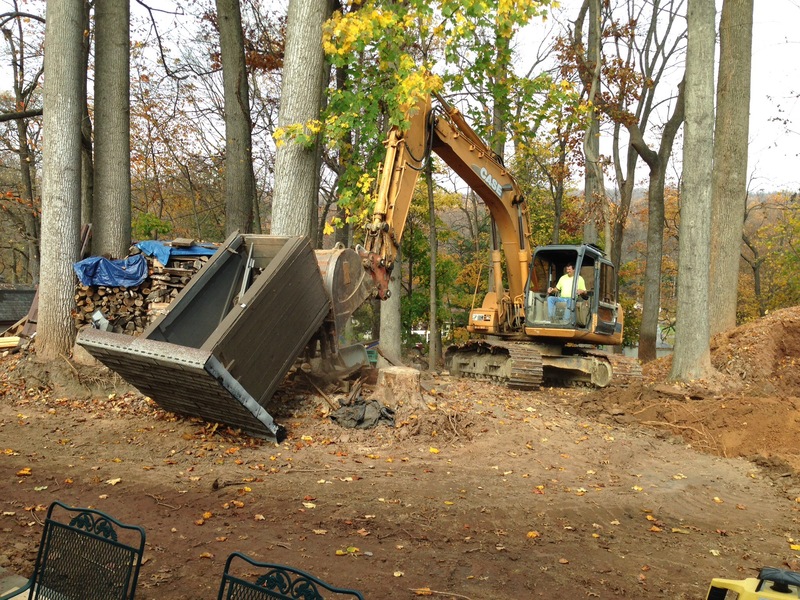 Friday our excavator arrived to build the septic system. He intends to finish Monday. Since a tank is being burried near the outhouse we decided it is time for it to go. So, we are without toilet facilities until the bathrooms are finished. Apparently, we are competing with many other construction projects. There is more work than workers and everyone is trying to complete their projects by the end of the year. That sounds like a good thing for the economy and that we need to be patient. We are hoping that this upcoming week will be more productive. We need to pick up the pace if we are going to be in the house by Christmas! Reinforcement – Nancy is home! 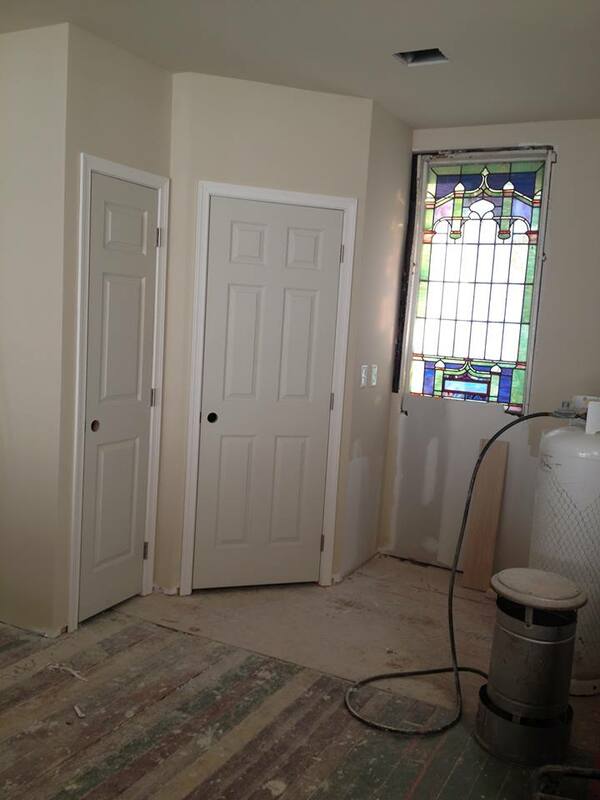 The interior doors were installed Friday. At the beginning of this week I was feeling project fatigue. We have missed our first two expected completion dates, July and then October, and we still have a long way to go before occupancy. Furthermore, it looked like we were not going to make much progress this week. Monday started with me working alone. About noon, the mason arrived and started repairing the rock exterior. Tuesday, it was just the two of us until the geo-thermal team arrived to run the water lines from the wells into the basement. They finished their work before the end of the day. Again Wednesday, it was the mason and me. Thursday afternoon the excavators arrived with a couple pieces of heavy equipment, but still we were not making any progress inside the house. So, I was discouraged with our progress when I left to pick up Nancy at Washington Dulles Airport Thursday afternoon. We missed opportunities during the week. On the other hand, it is wonderful to have Nancy back! The project and I need her energy and enthusiasm. We coped well during the two months she was gone, but it is so good to have her back. It is perfect timing. She will now be available to help make the critical finish decisions. With how quiet the place had been all week, you will understand my amazement at the beehive of activity that was buzzing around the place when Nancy and I arrived Friday morning. Seemingly out of nowhere appeared the General Contractor, electrician, and the several-man team that installs the doors, molding, etc. The mason was still there and the excavator team had grown to a half-dozen pieces of heavy equipment and at least that many workers. I was unable to count them, but when Nancy and I arrived at the project site we found over 15 people all busy with their specialized tasks. I think they accomplished a week’s worth of progress in one day!